FAST FACTS: Will be his eighth and ninth Indy car races here and 10th overall including his 2006 Atlantic race… In seven Indy car races, his best Toronto start is third in 2009 with Newman/Haas/Lanigan Racing and his best finish is fifth in 2010 with Newman/Haas Racing…His best finish this season is second place in Detroit Dual 1 and best start is fourth in Race 2 of the 2014 Houston doubleheader. FAST FACTS: Will be his first and second Indy car races here and seventh and eighth in the series.Filippi made four Indy car starts in 2013 for Bryan Herta Autosport at Mid-Ohio Sports Car Course and street races in Baltimore and the doubleheader races in Houston. In 2014, he competed in the two races in Houston where he earned a career-best Indy car qualifying position of fourth place for Race 1 and was in eighth place when he made contact with the inside wall of a turn on a restart while attempting to overtake Pagenaud and retired in 21st place. He brushed the wall in qualifying for Race 2 and bent the right rear toe-link which limited his starting position. Once the team replaced it, he was only able to complete one lap on red tires in the 15 minute session and was sixth fastest and started 12th. In the race he ran as high as fifth but had to pit due to a tire puncture. He was on target for a seventh place finish but contact with Montoya on the last lap dropped him to 15th… His highest series starting position is fourth in Race 1 in Houston 2014 and his highest finish is 10th in Race 1 in Houston 2013. 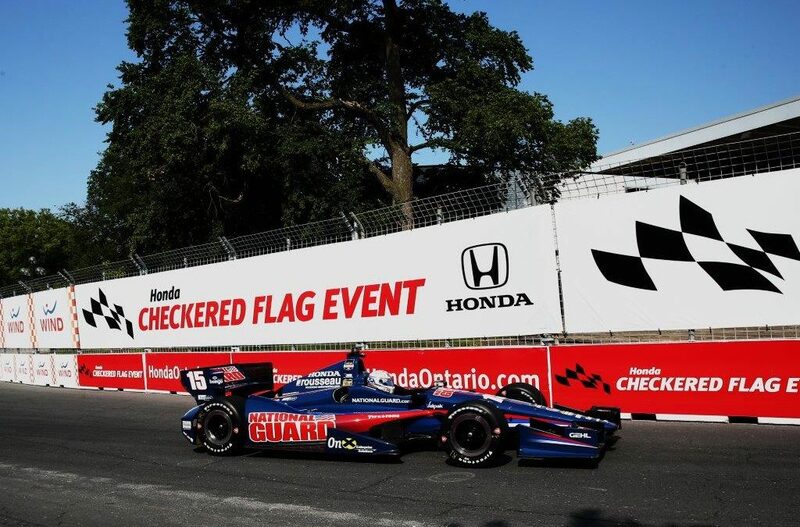 RLL AT TOROTO: The Honda Indy Toronto will mark the 15th year of Indy car racing for Rahal Letterman Lanigan Racing (RLL) here and the team’s 16th and 17th races. The team also competed in the Atlantic Series races here in 2003 and 2004. The team earned a total of four second place finishes (Rahal 1992, 1994, 1995; Michel Jourdain Jr. 2003) and best start was pole in 1992 by Bobby Rahal. Prior to the 2014 event, the team prepared a total of 26 Indy car entries for drivers Bobby Rahal (1992-98), Mike Groff (1994), Raul Boesel (1995), Bryan Herta (1996-99), Max Papis (1999-2001), Jimmy Vasser (2002), Michel Jourdain Jr. (2002-03), Takuma Sato (2012), Graham Rahal (2013 x 2) and James Jakes (2013 x 2).The team also prepared three Toyota Atlantic entries (Danica Patrick 2003-2004; Chris Festa 2004).The team has earned FIVE podiums (3rd – Rahal 1996), 9 top-five’s and 17 top-10 finishes at the track. Team co-owner Rahal competed in Toronto from 1986-1991 as a driver and from 1992-1998 as a team owner/driver. In 13 events, he earned one WIN (1986), two POLES (1987, 1992), and seven PODIUMS. He also started on the front row three times, earned 10 top-five and 11 top-10 finishes. NEXT UP: Qualifying for Race 1 will take place tomorrow from 10:00-11:10 a.m. ET and will be televised on NBCSN at 2 p.m. ET. The first of two 85-lap races will take the Green Flag at 3:55 p.m. ET Saturday and be televised live on NBC Sports Network beginning at 3:00 p.m. ET. Streaming video and Timing and Scoring information is available for all practice sessions from www.indycar.com and includes commentary by the IMS Radio Network. Timing and Scoring information for qualifying is also available live with commentary.